So you know not to just share and push only your content on StumbleUpon, right? The next question then is “What is the right content to share?” Good question; glad you asked. Follow the crowds: Basically, look at what other people are sharing and follow their lead. 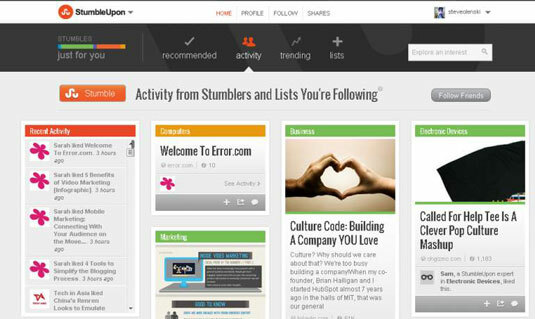 After you log on to StumbleUpon.com, you can see the more popular Stumbles from those you are following to get a sense of what people are sharing. To do that, start out from your Home screen and click the Activity link near the upper right of the screen. Doing so brings up a page with the words Activity from Stumblers and Lists You’re Following across the top. Scan through the listings here to see what’s hot — and what’s not. When using the StumbleUpon app on your mobile device, you can see the most popular Stumbles by tapping the button labeled — you guessed it — Popular. Mix it up a little: Don’t just share the same kinds of content from the same sources over and over again — spice it up a little. Say, for example, you love content from the Wall Street Journal website. That’s great. But chances are you can find articles about the same topics on other sites. Share them, too! Know your fellow Stumblers: After you are up and running on StumbleUpon and are following others and others are following you, you will get a sense of what to share. You’ll start to see patterns forming about what other Stumblers are sharing with you, and you can then use that information to hone in on what your fellow Stumblers want to see you share. Nothing will get you taken off someone’s list or unfollowed faster on StumbleUpon than sharing too many things in too short of a time frame. For example, if you’re sharing say 10–12 different websites at the same time, that is way too many and is the classic definition of information overload. Pace yourself, people. This is a marathon, not a sprint. Just like you wouldn’t want so many shares sent your way at one time, neither does anyone else. Another quick way to join the ranks of the unfollowed is to always share content from the same site. No matter how good you may think the content from that particular site may be, if people start to see the same site coming from you all the time, they may start to think that you’re spamming them. And no one wants that. Along the same lines of overloading with too many shares is the act of sending the same piece of content over and over and over and . . . you get the idea. If you shared the same content repeatedly, say, for five or six times and no one Stumbled it after any of those offers, chances are that they’re not going to Stumble it the next seven, eight, or nine more times you’re thinking of sharing it again. In some situations, repeating the same share is acceptable and may even be appreciated. For example, if you shared a piece of content on a potentially harmful virus a month prior and that same virus is still causing problems, resharing may help those who did not see your previous Stumble.